The East Palatka Holly is a cultivar of Ilex x attenuata which is a cross between Ilex cassine (Dahoon Holly) and Ilex opaca (American Holly). East Palatka is female and produces dark red berries. 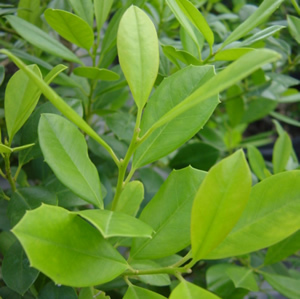 Ilex x attenuata ‘East Palatka’ is an evergreen shrub with lance-shaped light green, spineless leaves. The East Palatka Holly is a narrow pyramidal shaped tree that can get 12 feet tall and 6 feet wide and has a looser growth habit than Ilex x attenuata.